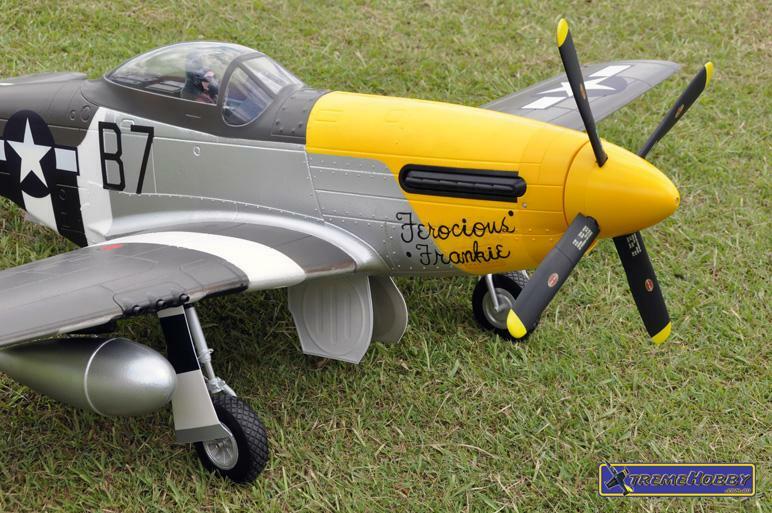 FMS 1700mm P-51D Mustang R/C Electric Warbird Airplane (PNP). Well Don't ask yourself the question anymore , YES "BIGGER IS BETTER". The ultimate FMS P51 1700mm has arrived. I have to say look at the size of this warbird!. From the moment the sample boxed arrived at Xtreme Hobby the staff were overwhelmed with its size and presence. It's just an outstanding re-production of the hottest selling FMS plane to date, but this time it has MORE features and of course it's Bigger, in fact it's 300mm's bigger than the previous version, and don't let that 300mm's fool you, this plane dwarfs the previous version. Building this kit is easy, it took no longer than 2 hours to complete and used very little glue, in fact it was just a drop here and there, basically the entire kit is screwed together, giving the plane amazing strength and rigidity "also allows the wing for easy removal for loading into a standard size passenger car". All servos are pre-installed, along with the ESC, Motor, Retracts, NAV lighting system, Radiator Door and Sequencer setup. The wings utilise a new Ribbon Cable system combining both Flap and Aileron Servos, LED Lighting and Retract into a simple single ribbon cable extruding from each wing, this make wiring easy and clean, compared to the usual Birds nest of wires in such a detailed aircraft. The plane performs as good in the air as it looks on the ground. 2 clicks of trim is all it took to set this bird on a true straight and level path. In fact the YouTube video below features the very first maiden take-off, you can see how true the plane sits, it really is a testament to the team at FMS on their design skills on such a large scale Warbird. Easy for Grass Take-off and landings, easy visability for orientation, and agile in slow or fast paced flight. This plane will no doubt be the envy of your fleet. We have very limited stock coming of this plane since its mass volume of each carton takes so much room in our container shipments. Don't wait to order your one today. This is the Future of Foam Warbirds, nothing on earth touches it, see for yourself!. Removable Wing for easy Fitment into a Standard size car.